The Stone of St. Alessia has been stolen from the Chapel of Talos in Bruma. Speak with Azzan in Anvil to receive this contract. Travel to the Chapel of Talos in Bruma and speak with Cirroc about the theft of the Stone of St. Alessia by bandits. Follow the bandits out of town - heading east - and you will encounter K'Sharr, one of their members. K'Sharr will tell you that ogres stole the Stone from the bandits. The ogres are holed up in Sedor - an Ayleid ruin (quite a ways) to the east. Proceed to Sedor and retrieve the Stone, evading or eliminating any ogres you encounter. Return the Stone to Cirroc and he will reward you with three Strong Potions of Healing. Report back to Azzan for payment and he will inform you that he has no more contracts for you. Speak to Azzan in Anvil. He will tell you that Modryn Oreyn has been drummed out of the Guild as a result of Viranus Donton's death at Forsaken Mine. If you have not yet done Burz's last two quests, Azzan will also inform you that you have been demoted to Defender for your part in the affair. If asked, he will tell you that you may be able to regain your former rank if you complete "a few contracts" first. With that out of the way, Azzan will brief you on your next mission. 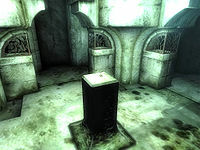 The Stone of St. Alessia has been stolen from the Chapel of Talos in Bruma and you must recover it. Report to Cirroc at the chapel for further information. When you find Cirroc, he will tell you the Stone was stolen by bandits last seen heading to the east, and urges you go after them. Once you do, your compass will lead you to K'Sharr. He will tell you that he and his cronies stole the Stone, but were ambushed by ogres. They stole the Stone in turn, leaving him as the only survivor. He believes the ogres are now at Sedor, an Ayleid ruin along the road between Bruma and the Temple of the Ancestor Moths. K'Sharr will mark its location on your map. You can kill K'Sharr at this point if you wish. You will not receive a bounty or gain any infamy for doing so, although killing him can start the Dark Brotherhood questline. Proceed to Sedor, enter the ruin, and recover the Stone, sneaking past or killing any ogres you may encounter en route. The Stone is in a locked room which must be opened via a two-step process. First, there is a pressure plate directly outside the room. This seemingly does nothing, but in fact opens the gate to a walkway which passes directly overhead. At the end of this walkway is a push block which opens the gate to the room itself. With a very high Acrobatics skill and good timing, it is possible to jump up from the vicinity of the pressure plate and push the block from the apex of the jump. Having recovered the Stone, return it to Cirroc, who will express his gratitude and give you what he can - three Strong Potions of Healing. Report back to Azzan to receive the standard level-dependent gold reward and one Fame point. He will also inform you that he has no more assignments for you. If this is the first Fighters Guild quest you have completed since Trolls of Forsaken Mine, no promotions are available and you will need to go to Burz gro-Khash in Cheydinhal for your next quest - The Noble's Daughter. If you have completed The Noble's Daughter already (but not Mystery at Harlun's Watch), Azzan will now be willing to reinstate you to your previous rank of Guardian. Your next quest will be Mystery at Harlun's Watch. If you have already completed both of Burz' quests (The Noble's Daughter and Mystery at Harlun's Watch), you can now be promoted to the rank of Champion (Oreyn's previous title). Your next quest will come from Modryn Oreyn, in his house in Chorrol: Information Gathering. It is possible to fast travel to Sedor after K'Sharr marks it on your map, even if you have not been there before. It is possible to pickpocket the stone back from Cirroc, however it is considered a quest item and cannot be dropped. Azzan may neither offer this quest, nor demote you to the rank of Defender, after you have completed Trolls of Forsaken Mine. This can occur regardless of whether you have completed both quests given by Burz gro-Khash. ? To fix this, you may manually set your rank to Defender before speaking with Azzan, using the console command Player.SetFactionRank 2228F 5. 10 Azzan has told me to report to the Chapel of Talos in Bruma and speak with the priest Cirroc about a contract. 20 I've spoken to the priest Cirroc in Bruma. He would like me to retrieve a holy relic of the Church, the Stone of St. Alessia. He believes it was stolen by bandits recently, and he's heard that they were headed east out of town. 30 I've found the lone survivor of the group of bandits that stole the Stone of St. Alessia. He and his men were attacked by ogres and left for dead. He tells me that the creatures took the Stone and all their other precious stones with them. He believes that the creatures live in the Ayeleid [sic] ruin of Sedor. 40 I have found the Stone of St. Alessia in Sedor. I should return it to Cirroc at the Temple of Talos in Bruma. 50 I have returned the Stone of St. Alessia to Cirroc. As a show of his gratitude, he's given me some Strong Healing Potions. I should return to Azzan to collect my reward. 100 Finishes quest Azzan has paid me the balance of the contract. He tells me that he has no further contracts to offer, but I should speak with Burz gro-Khash in Cheydinhal. It is possible to use the console to advance through the quest by entering setstage FGC05Stone stage, where stage is the number of the stage you wish to complete. It is not possible to un-complete (i.e. go back) quest stages. See SetStage for more information.